Read this article in the Asian Reporter this afternoon. What are your thoughts? Discrimination or preservation? From The Asian Reporter, V21, #10 (May 16, 2011), page 8. SAN FRANCISCO — A California proposal to outlaw the title ingredient in shark fin soup, a traditional Chinese delicacy, has turned into a recipe for controversy in San Francisco, a city that is nearly one-third Asian and home to the nation’s oldest Chinatown. A bill moving through the state legislature would ban the sale, distribution, and possession of shark fins. State and federal laws prohibit shark finning in U.S. waters, but do not address the importation of fins from other countries. Supporters say shark finning is inhumane and a threat to the ocean ecosystem. They say an estimated 73 million sharks are slaughtered each year, mainly for shark fin soup, which can sell for more than $80 a bowl and is often served at weddings and banquets. "The collapse of shark populations because of overfishing is a conservation issue of global concern, and the demand for fins drives overfishing of sharks," said Mike Sutton, director of the Center for the Future of the Oceans at the Monterey Bay Aquarium, located about 115 miles south of San Francisco. Alex Ong, chef at the Pan-Asian restaurant Betelnut in San Francisco’s Marina district, said the broth in shark fin soup is what provides most of the flavor, and the fins themselves can be easily substituted by other seafood or even creatively disguised starch. Ong said when he saw video footage of fisherman slicing off sharks’ fins and tossing the animals back into the ocean to die, the images hit him "right in the gut" and he vowed to work to stop the practice. But critics of the proposed ban say the consumption of shark fins is a cherished cultural tradition. "This is traditional for us. When you say no to shark fin, that’s profiling," said Henry Cheung, president of Charlie Seafood Inc., a San Francisco-based wholesaler and importer. "The law doesn’t ban shark meat or a handbag made with shark skin — just fins. I myself believe it’s unfair." Cheung also questioned the need for a ban on a product he says is already losing popularity, particularly among young people. He said his business stopped importing shark fins years ago due to declining demand. In a statement issued February 14, the day the legislation was introduced, state senator Leland Yee (D-San Francisco), called the measure "an unfair attack on Asian culture and cuisine." 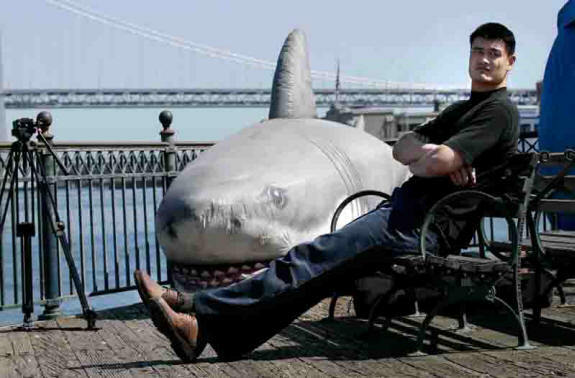 Yee, who officially kicked off his campaign for mayor of San Francisco this month, said efforts should be focused on strengthening conservation efforts and increasing penalties for illegally killing sharks. In addition to local chefs and politicians, a few celebrities have jumped into the debate. Chinese basketball star Yao Ming is loaning his celebrity to the anti-finning movement, appearing on city busses and billboards urging residents in Chinese and English to "Join me, say no to shark fin soup." The Houston Rockets center came to town to film a public service announcement for the international conservation group WildAid. Shark fins also may prove an unexpected ingredient in this year’s mayoral race, which includes three prominent Asian-American candidates: Yee, board of supervisors president David Chiu, and assessor-recorder Phil Ting. San Francisco is home to the largest percentage of Asian Americans of any county in the continental U.S. Political observers expect voter turnout from that community to be high in November, following the momentum generated earlier this year by the appointment of Edwin Lee as interim mayor — the city’s first Asian-American leader. Chiu and Ting appeared at a news conference organized by WildAid and expressed their support for a shark fin ban. Afterward, Ting said the legislation presented an "important opportunity to talk about the importance of sustainability," but that he didn’t think it was among Asian-American voters’ top concerns. "The economy, jobs, the city budget — Chinese-American voters are focused on those issues," he said. A poll released May 6 by the Monterey Bay Aquarium indicated strong support of a fin ban among Californians. More than three-quarters of the 600 registered voters surveyed said they support the bill. Of the 218 respondents who were Chinese American, 70 percent said they support it. "There’s an attempt to portray this debate as an east-versus-west cultural thing," said Peter Knights, executive director of WildAid. "The reality is this is east and west versus a small minority of people." The measure is awaiting a hearing by the state assembly. Hawaii has already adopted a ban, and similar legislation is advancing in Oregon and Washington state.